Bake right along with this video for Mini OREO Surprise Cupcakes. 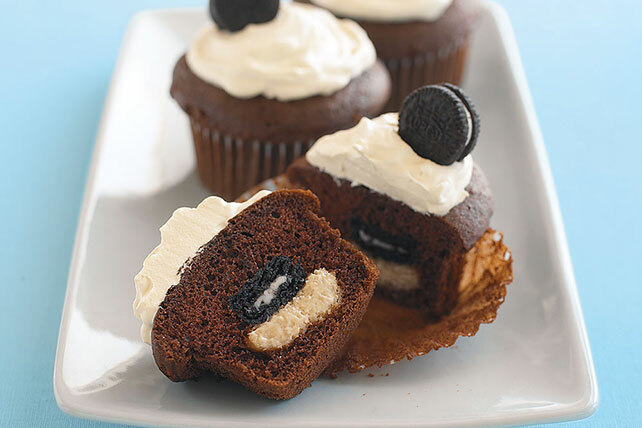 Mini OREO Surprise Cupcakes are easy to make and offer a cookie and cheesecake surprise. Bake 19 to 22 min. or until toothpick inserted in centers comes out clean. Cool 5 min. Remove from pans to wire racks; cool completely. Frost cupcakes with COOL WHIP. Top with remaining cookies just before serving. Try our recipe for Black Forest Stuffed Cupcakes. With their built-in portion control, these luscious cupcakes make great treats. For easy portioning of the cream cheese mixture into cake batter, spoon cream cheese mixture into large resealable plastic bag; seal bag. Snip small corner off bottom of bag with scissors. Use to squeeze cream cheese mixture over batter in each muffin cup. Frosted cupcakes can be stored in refrigerator up to 3 days. Top with remaining cookies just before serving.